What Causes Staining and Discoloration? There are two main types of stain: intrinsic and extrinsic. Intrinsic stain occurs in the inner layers of the teeth, while extrinsic stain affects the outside surface of the teeth (called enamel). What Are Your Options For Professional Teeth Whitening? You might be tempted to go with a store-bought whitening product, but the FDA limits their strength, so they can’t provide the same results you would get from a professional treatment. This option is done in two visits. At the first, impressions are taken to custom-make plastic trays for you to use at home. When you return to pick up your trays, you’ll get a supply of whitening gel along with instructions. You’ll wear the trays for 30-60 minutes a day until you get your desired result, which usually takes about 2 weeks. After you’re seated and comfortable, your lips, gums, and cheeks will be covered to protect them from irritation. Then a whitening gel will be carefully applied to your teeth before they’re exposed to a special light (in 15-minute increments) to accelerate the process. Throughout your visit you’ll be monitored for sensitivity until you get the final result. Finally, you’ll be given instructions for maintaining your new smile at home. Having a dentist evaluate your teeth beforehand is the best way to find out which option is best for you. 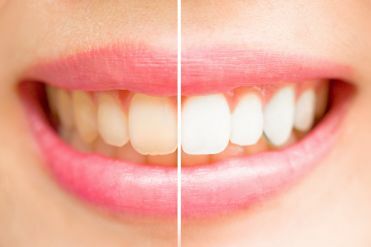 While many people get great results from a whitening treatment, there are others who have severe staining that doesn’t respond well to whitening agents. In these cases, a dentist may recommend porcelain veneers or cosmetic bonding to give you better results. With a treatment plan from a professional, you can avoid investing in something that doesn’t work well the first time. Regardless of which type of treatment you get, you’ll soon be on your way to having a beautiful white smile that you’ll love to show off! Dr. Gary Chaffee is a general, restorative, and cosmetic dentist who loves seeing the self-confidence his patients get after teeth whitening. He knows that every patient is unique and always starts by closely evaluating their needs so he can recommend the best treatment plan for them. If you want a whiter smile and have any questions, he can be reached via his website.